Eddie Scarry, media reporter for conservative outlet 'Washington Examiner,' set Twitter on fire on Thursday with an amazingly terrible tweet. If you were offline this afternoon, you missed a tweet so exquisitely and jaw-droppingly bad that the ratio reached heights we hadn’t seen before…and may never witness again. After getting mercilessly dunked on by basically all of Twitter, including the Dem Socialist lawmaker herself, Scarry eventually deleted the tweet. Deleting it didn’t make things any better, though. For her part, Ocasio-Cortez blasted him for being misogynist and not apologizing to her. And his excuse was also ratio’d into oblivion. 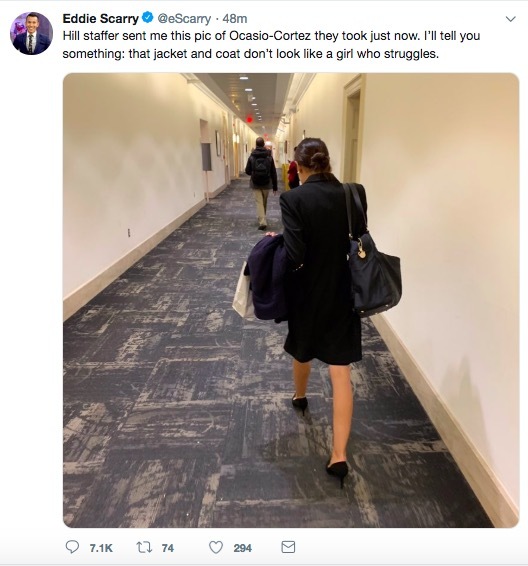 While the initial tweet seemed to be an attempt to somehow portray Ocasio-Cortez as being dishonest about her current financial situation because she was wearing normal professional clothing and not literal rags, the stealthy nature of the photo fit into a pattern of behavior for Scarry. See, he has a history of taking creepy pictures of women and making inappropriate remarks online. Back in 2012, then-Washington City Paper writer Will Sommer (he’s now with the Daily Beast) wrote about Scarry’s habit of taking “surreptitious fetish shots.” Sommer noted that Scarry, then with gossip blog Fishbowl D.C., was being left “unsupervised” because lead editor Betsy Rothstein was on vacation. Betsy Rothstein, the editor of media blog Fishbowl D.C., has a fondness for announcing that various women are tramps. But with Rothstein on vacation from Fishbowl this week, a surprising truth has come out: Rothstein is the least offensive person writing for her site. First up is contributor Eddie Scarry, already an intriguing figure because of his role in Fishbowl’s growing oeuvre of surreptitious fetish shots. Around White House Correspondents Dinner time, Scarry took some shots of unknown men and womens’ butts and categorized them (“particularly bulbous”). More recently, he tweeted a picture of a woman’s foot because she had a bunion. In other words, maybe not the best person to leave unsupervised. They weren’t exaggerating about Scarry’s behavior back in the day, either. A scan through the media reporter’s Twitter account shows that he loves to creep on folks and say cringeworthy stuff. If I go into a bathroom and a woman has been in before me, I hold my breath. Watching this Hispanic woman deal with her 2 kids is causing me so much anxiety. And to schedule my vasectomy. Until Mo said it, I wasn't aware there was an "angry black woman" stereotype. I thought they all just said "girlfriend" a lot. Woman at Starbucks wearing top that doesn't quite cover her whole stomach. Unintentional. I wonder if she has a tan line across her middle. Anyway, just a normal guy having a totally normal one.